20151027 - Up in the am and dropped D off at school on the way In to work. 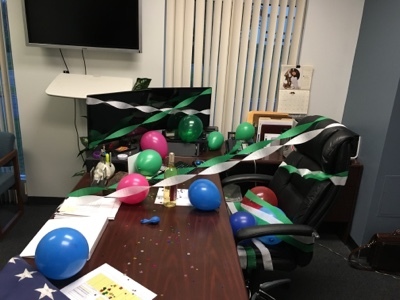 I was greeted by a birthday decorated office and desk. Home ate and LJG&I to Old Navy to stand in a ridiculously long line for underpants. D stayed home to post things on eBay. We headed to Payless to look at shoes. G melted do own, then L and J&I ended up the only ones to get shoes. Home and stayed up till 1am with D watching game 1 of the World Series.